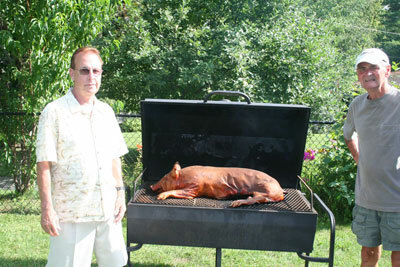 We are the largest Do-it-Yourself Pig Roasting business in Canada. Our DIY package includes everything you will need for an easy successful feast. Honestly, roasting one of our pigs couldn’t be any easier. Our BBQ’s work just like a large oven with zero turning needed. On pick up day, we will give you a walk through demonstration including a take home instruction sheet. 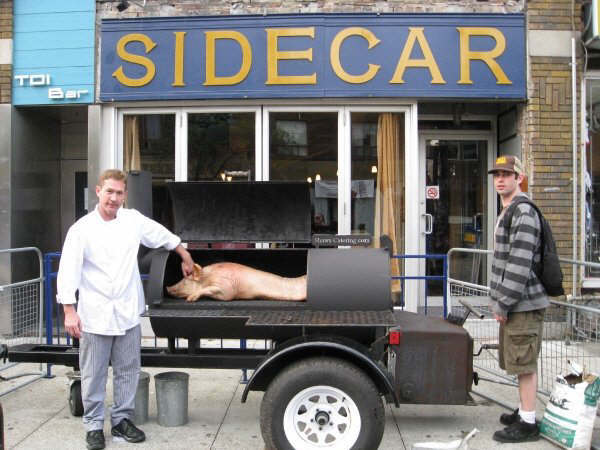 It only takes 4 hours to roast our small pig and our large pigs take around 9 hours. BBQ and Maple Charcoal comes with every package. 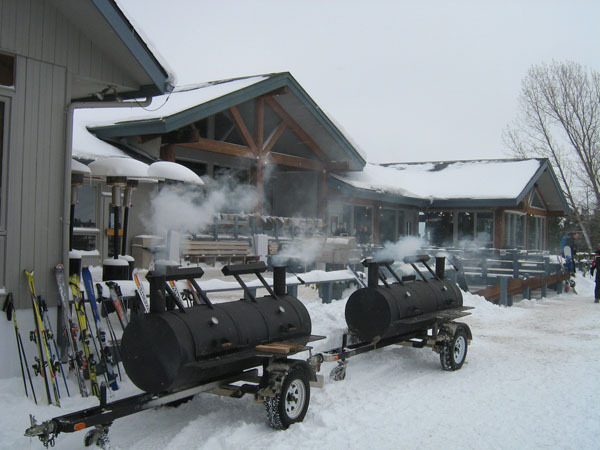 We designed our BBQ’s to be charcoal fired, yet easy to operate. Only rented as part of our BBQ Pig Package. We do not rent our BBQ’s without one of our pigs going with it. 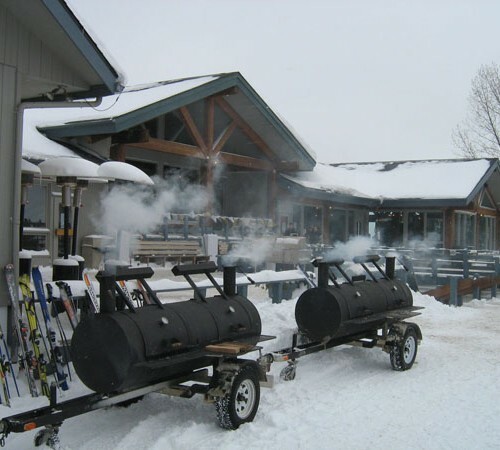 You will need a trailer or a pickup truck (no cap or tunnel cover) to transport your large rental BBQ home. Large BBQs will not fit into any Mini Van or SUV. When your celebration is over, leave the mess to us. No need to clean the BBQ. Just return it back to us. You can order our 4 most popular Homemade Salads, to be picked up with your BBQ Pig. The best part of our do-it-yourself division is hearing the stories each year about the nature of their celebration and where it will take place. Sometimes we receive emails with pictures and a tale of good times had. We enjoy this so much that we thought you would too. Thank you to the people who shared their stories. Kris and our guest of honor, 'A little NHL promo, thanks for making this a great day for my parents, everyone loved it. 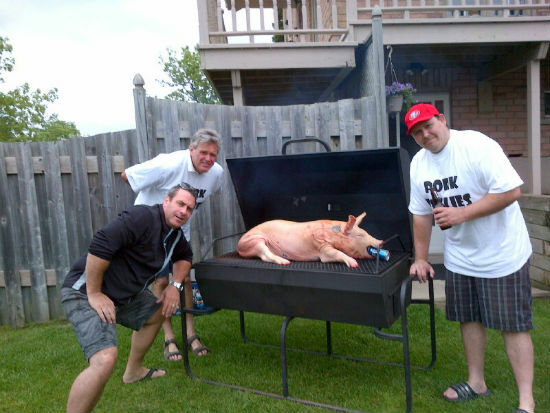 Subject: Awesome Pig Roast To the team at Shaws, Well I finally did it, my first pig roast. I have to say what an awesome experience it was and all of my guests love it. I want to thank all of you for all of your support and assistance you all lent me when I arrived to pick up all my stuff. You were all so friendly and your hospitality was top notch! The pig tasted outstanding! A true testament of the quality you continue to promote ands stand by! I will be doing this again and I would recommend anyone try this as it is an outstanding experience. You guy's were awesome and thanks again. 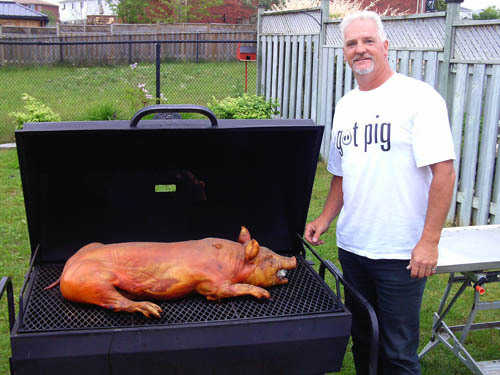 Good morning... We rented a BBQ and got a pig from you for the long weekend. Your co-operation in allowing us to pick up the BBQ on Wednesday and the pig on Friday.. made the event that much easier to co-ordinate. The pig was done perfectly following your instructions. We would definitely use your services again and recommend you to our friends and family. Chris and I became engaged over the past weekend, and we are looking at a luau theme for a wedding, so you will definitely be hearing from us again. 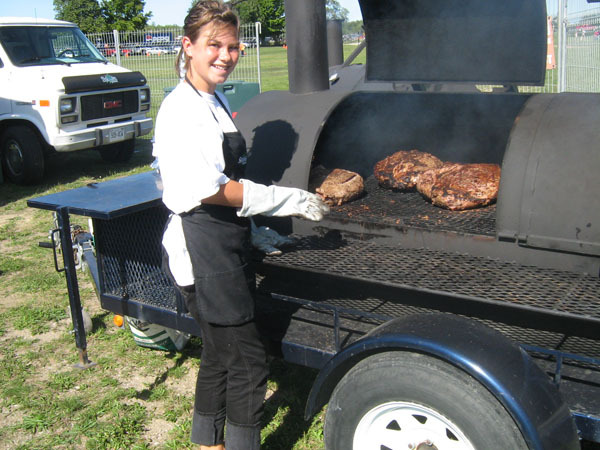 On behalf of all who attended our pig roast (we had the largest attendees ever, we fed 117 people and had some leftovers. 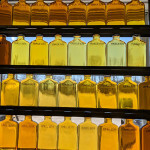 Hi Terri-lynn, Just wanted to thank you for all your help. The BBQ was perfect. And the pointers even better. Thank God I went with him to get it. I am pretty sure the outcome wouldn't have been the same. Mr A.D.D boy would have been lost in the first 30 seconds of instructions. It was awesome to meet you guys. Even when we were leaving Kev said, "now that's a couple I could have a beer with". That's saying a lot cause he barely will sit still long enough to have a beer with the friends he has now. lol I am sending you some pics.. Thanks again and we will do it again next summer for sure. 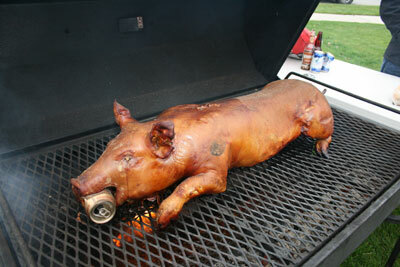 Here are a few pictures of the pig roast that my sister Lori Schaaf arranged for my 50th birthday party. That’s me (Karen Crawford) in the nice hat and one of our friends. Picture # 7 is the pig with the hat and glasses I told you about. Thanks it was wonderful! Another awesome pig! Everyone said "The best one yet" ... AGAIN !!! Thanx for another great party, guys. We'll call for next year! Hi Tom.....I tried to reach you live, but no luck, so I am sending you the feedback from our 50th birthday bash June/10. There were 3 of us celebrating and decided a pig roast would be fun. We checked out pricing for catering and it wasn't within our budget, in fact, way beyond. We almost gave up the whole idea until we checked out what you have to offer for the"DIYer". We were thrilled with the pricing and even more with the results. It was easy, no fuss, no mess. Idiot proof. And the results......outstanding!!! Delicious beyond words. Thanks, so much....I will continue to recommend your services.....and I will have to find another excuse to throw a great back yard party. Here is a photo of our chef for the day! -Heidi and Mike PS. Thanks for the surprise t-shirts. Mike wore his all throughout the party with pride! A very sweet touch to an already great service. Hi Tremendous thanks goes out to you for setting us up with a no-fail event! We're not as glamourous as others in the setup (pig rests on the tailgate of my truck) but it was quite a show for everyone! About 25 of all ages were in attendance and there were pleanty of left overs to be had. Based on the feedback we've had, this may well become an annual event. Thanks again! Hi there Shaw’s Catering – I’ve been meaning to send this email for almost a year now! 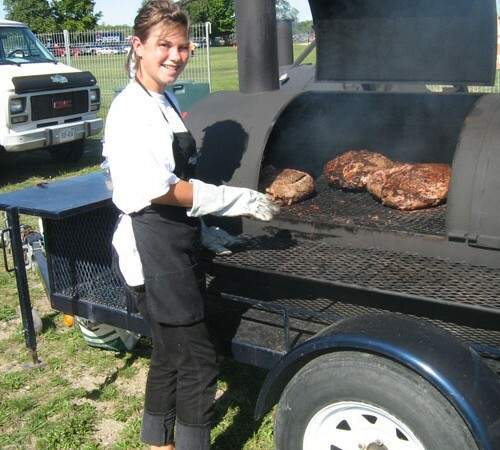 I just wanted to let you guys know that we had our first Family Pig Roast last July 08 and it was FANTASTIC! Everybody raved about how awesome the pig was and what a great idea it was. All the guys were impressed with the BBQ and the whole set up of course. You guys were also very wonderful in getting us all arranged and providing us with the instructions on how to pull the whole thing off. 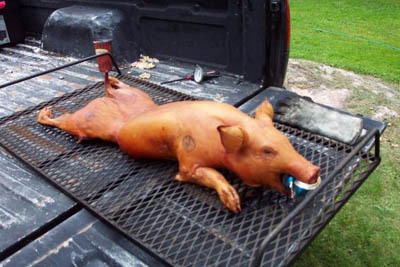 It was so great that we’ve already booked our BBQ and pig for this year! It’s going to be an annual event that everyone in our family looks forward to, for sure! 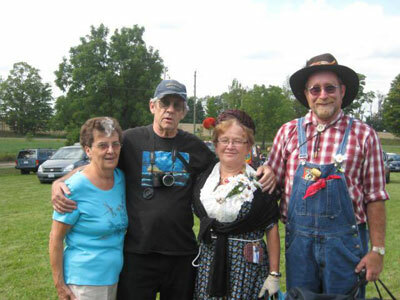 We even have guest coming from California this year – they heard what a great time it was last year and decided to plan their holidays around the time of last years pig roast hoping they could come to this years. 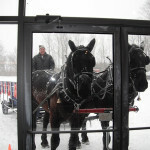 Looking forward to another Fabulous event – Thanks again for doing such a wonderful job – See you in early July. PS. Attached is a picture of my husband Paul (beard) and my Brother Darrin – getting ready to carve her up! Terri-Lynn and Tom, First we must apologize for this email being so overdue. 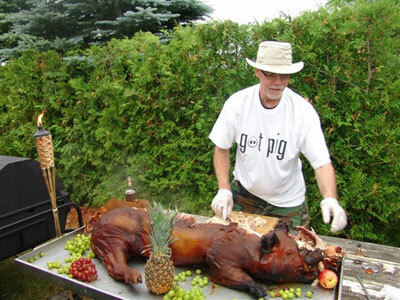 We had our 1st pigroast in ’04 and it was a huge success. So much so that it has now become an annual event for our Canada Day long weekend. Everyone was amazed at how good the pig looked while cooking and throughout the whole picnic (due to the Shaw’s unique roasting method!). 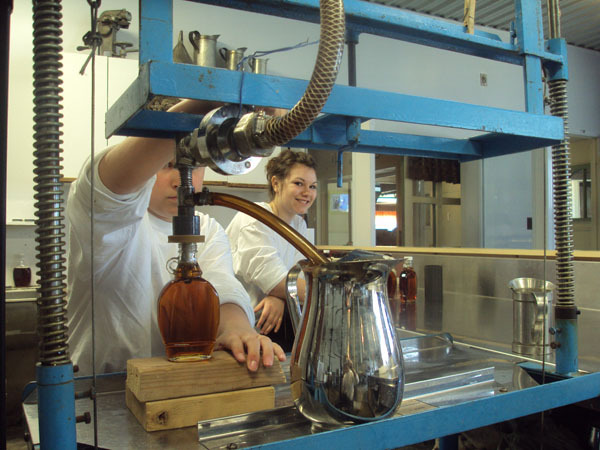 Kids (and adults) were constantly trying to sneak a peek in the roaster! 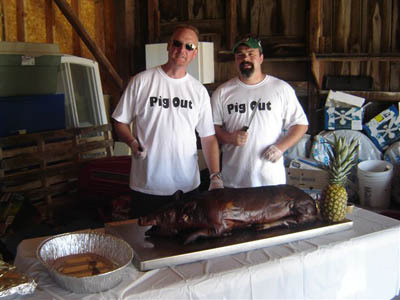 Word got out and our 2nd pigroast in ’05 was even bigger and better with about 130 guests – almost double the first. 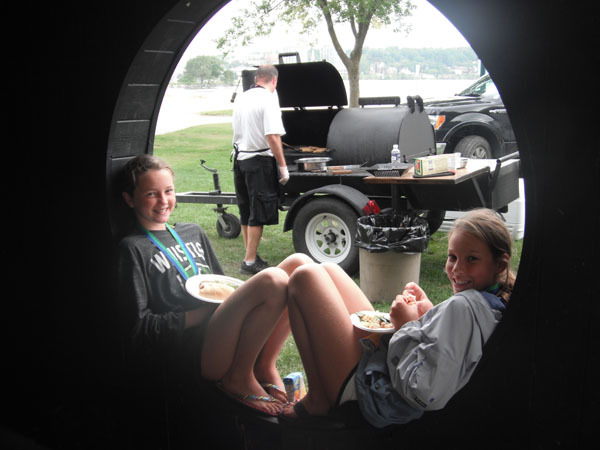 We’re now looking forward to our 3rd annual pigroast - a highly anticipated event at our lake. 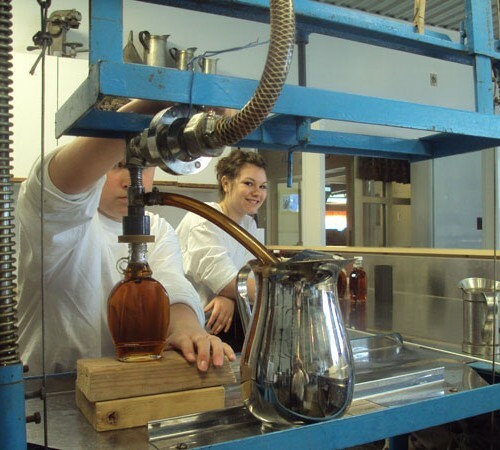 We couldn’t have done it without your equipment and all your helpful hints and guidance. Thanks so much for making this the perfect cottage weekend! 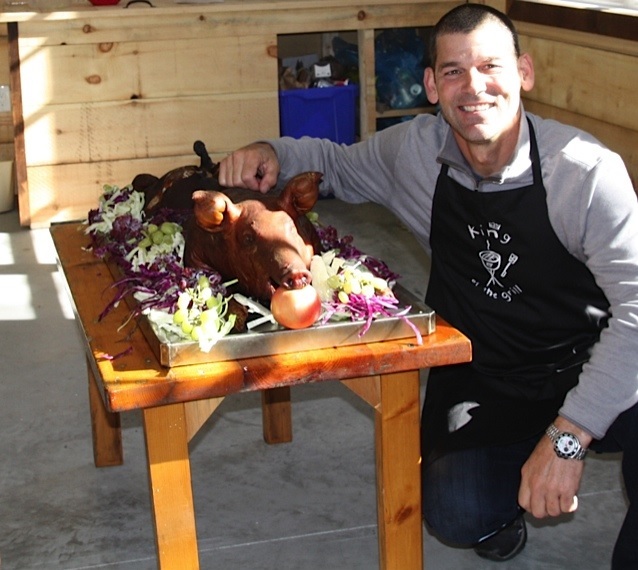 Dear Tom & Terri-Lynn, Thank you so much for the Perfect pig roast! It really was fun learning the basics and enjoying the juicy results! I think everyone voted we do this more often, and prompted some to consider their own backyard roasts! We look forward to speaking with you again soon. Hello Terri Lyn, Thanks for setting us up for our first pig roast. It went off without a hitch. The meat was amazing and we'd heard comments, such as "this was the best food I've ever had a camp, sure beat the usual pasta's, this is the best pork I've ever had......". There were a few panicky minutes when we realized that one end of the BarBQ wasn't staying lit, but nothing a blowtorch and rotation of the guest of honour couldn't fix. I thought you'd want to see the final shots. We definitely want to do this again. Thanks.